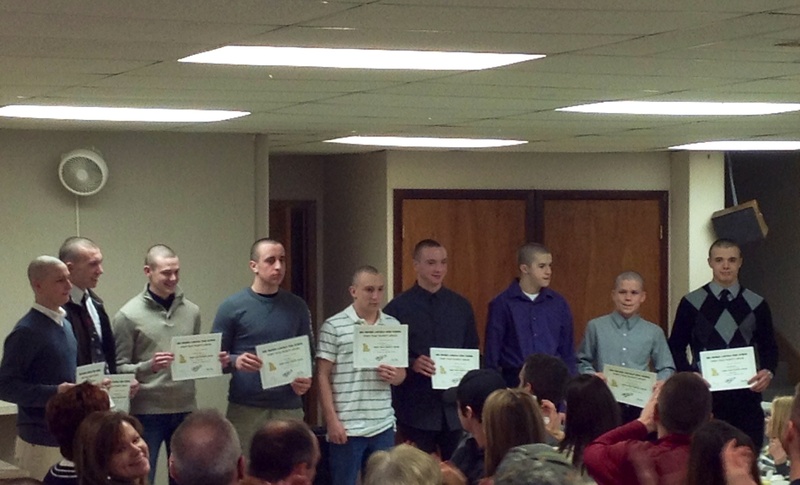 The men’s team celebrated a successful season at Monday’s (2/17) end-of-season banquet. The 2013-2014 season was filled with surprises and triumphs. When season started November 11th, the team was made up of six returning members and 14 rookies. One of the best things about this season is the way the guys all came together, supported each other and really bonded. The coaches often heard they were like brothers – and that is a great thing! Then there were the meets! The team won several close meets this year. In fact, three were by 7 points or less. Being able to do so is another credit to the guys; from top to bottom, they learned how to perform under pressure. Lastly was the big district & state meets! As mentioned district night, it was the best performance ever. Not only did 100% of the team drop time of their seed times, the guys also dropped more time per 100 yards (2.65 seconds!) then any other team before. Then the Rails headed to state where the relay dropped more time and finished 23rd! Of course, banquet was also a time for awarding junior varsity and varsity letters along with the team awards. See the award recipients below. Most Valuable Player (Outstanding Swimmer of the Year Award): This award is given to a swimmer that displays team leadership and excellent swimming abilities. Prior to 2005, the award was given only to swimmers who had been members of the team for at least two years. In 2005, the requirements were changed to allow a swimmer of any age displaying outstanding leadership skills and swimming ability to receive the MVP award. Tom Cady Achievement Award: This award was created in 2007, 40 years after Tom Cady first became a Lincoln swim coach. It’s given out to a swimmer or diver that displays a year-long dedication to the sport of swimming, and thus a dedication to the Lincoln Swim Team. This award recognizes swimmers for their dedication, not just their ability. This award was dedicated to Tom to thank him for his life long dedication to the sport of swimming and, more specifically, to Lincoln High School. Rookie of the Year: This award is given to the best “rookie” of the season. It recognizes a team newcomer for their contributions made to the team including ability, dedication and success in competition. The award doesn’t have to be given to a freshman, but rather can be awarded to any swimmer who completed their first season on the team. Most-Improved: This award can be awarded using two sets of criteria, the swimmer that improved the most during one season or the swimmer that improved the most from a prior season. Sometimes, there is a winner using each set of criteria because both improvements deserve recognition and acknowledgement. Workhorse Award: This award, simply put, is given to the athlete who works the hardest. They are at practice on time, don’t miss sets during practice, and don’t miss practices in general. They put a lot of effort into the season, and this award recognizes that hard work. At times this award is given to a junior varsity team member and a varsity team member. Team Captains: Team Captains are awarded at the end of each season by the coaches. The Team Captains are the athletes that demonstrated great leadership ability throughout the season on a consistent basis.